The best PDF to Image Converter to convert PDF to JPG/BMP/PNG/PCX. iMacsoft PDF to Image converter (Windows version) is professionally competent application for Windows users to convert any PDF documents into standard image files formats like JPG, JPEG, PNG, BMP, PCX, TGA, etc. with minimum consumption of time. This PDF to Image Converter utility is completely reliable and tested for multi language PDF documents and preserved whole content of original PDF document after conversion in image files, even not require to install Adobe Acrobat, Acrobat Reader or other PDF readers. With this advanced PDF to Image Converter, it can also convert certain page or page ranges of PDF files into image files for backup, easily set image DPI for document print with auto refining resolution. In the process, convert PDF documents into image files and retain all graphics, drawings, diagram, color, elipse and other symbols. It supports batch conversion while upload several PDF files at one time. The PDF to Image Converter offers fast PDF conversion of number of PDF documents to image files or batches of PDF documents performs with best results, ideal choice to help you easy to use. Free download and have a trial. iMacsoft PDF to Image Converter can help you to convert PDF to into standard image file formats, such as JPG, JPEG, PNG, BMP, PCX, TGA, etc. 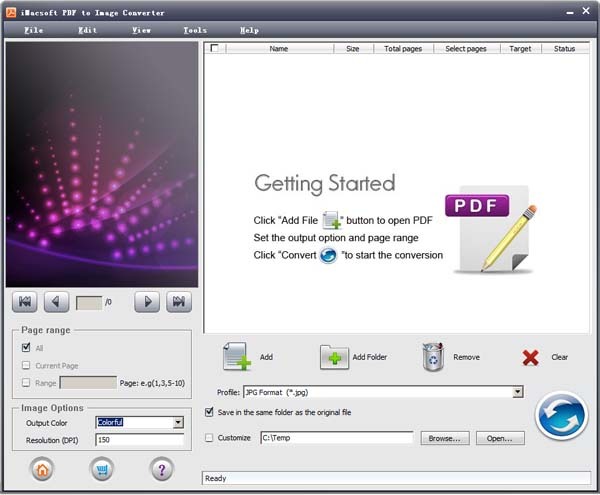 iMacsoft PDF to Image Converter software is a standalone program for PDF to Image. It does not need Adobe Acrobat or other third-party controls support. Multithreading and batch conversion provide super fast PDF to Image conversion speed due to multi-core CPU support. Faster than any other PDF to Image conversion software. At times you need to convert only selected pages of your document. In this scenario, you don’t need to convert the complete document. iMacsoft PDF to Image Converter allows partial document conversion. Specify the pages or page range for conversion and the tool will convert the document accordingly. iMacsoft PDF to Image Converter can convert PDFs generated through any application into Image. This makes this tool quite versatile. How to convert PDF to Image formats?